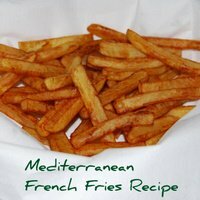 This really is the best french fry recipe. It's so easy and quick, and the results are amazing. These crispy fried potatoes, cooked in healthy olive oil, are golden and crunchy on the outside and fluffy inside. The secret is in the blanching...this cooks the french fries slowly without browning at a lower temperature. You then take them out of the oil, allow the oil to heat up to maximum, then you pop them back in to go a wonderful golden brown. You will never have tasted french fries as good. First of all pour sufficient olive oil into your deep fat fryer. Set the temperature to 150ºc/300ºf. Have a bowl of cold water ready to put the raw fries into. Cut the peeled potatoes into 1 centimetre slices, and then cut the french fries into 1 centimeter in width as in the picture above. As you finish cutting them into shape, immediately put them into the bowl of water. When all of the french fries are ready, pour them through a collander, giving them an extra rinse under the cold water tap. Shake well to remove the excess water and dry with plenty of kitchen roll. 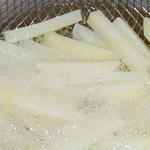 When the oil has come to temperature, pile the fries into the basket and place in frier. Allow to blanch for 5 minutes, shaking them occasionally to keep them separate. 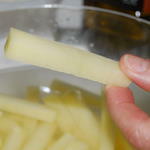 Place more kitchen roll into the dry collander and pile in the drained, blanched french fries. Turn up the temperature of the deep fat fryer to 190ºc/375ºf. Keep the basket out of the frier, and pile the french fries into it, when the excess oil has drained off them into the kitchen paper. As soon as the oil has got to temperature lower the basket into the frier. 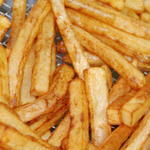 Cook the french fries until they are a golden brown in colour and crisp, shaking them occasionally, about 3-4 minutes. Lift them just out of the oil and give them a good shake to remove any excess. Drain for a few seconds on more kitchen paper. Line a basket or serving bowl with a white napkin and pour the fries into it. We like to sprinkle them with a little salt, then serve immediately piping hot.